Smartphones are playing a major role in buyer interaction with retailers and brands, while browsing or shopping across channels. 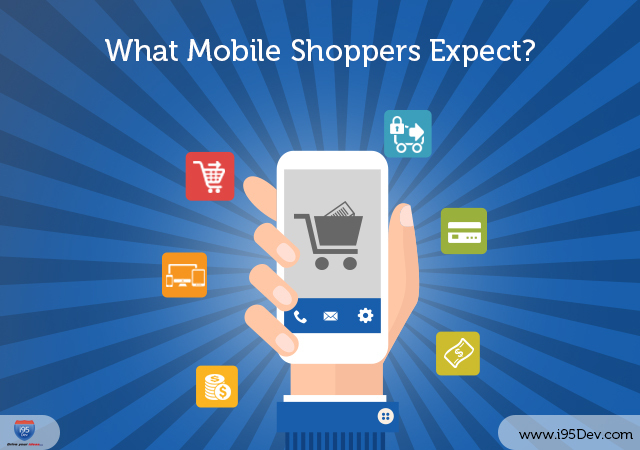 With digital mobility and connectivity growing more important every day and customers keeping their mobile devices nearby and checking them frequently, this decade is all about mobile performing an increasingly important role in the way that customers research, browse and shop. As per statista.com, US ecommerce sales amounted to US $289 billion in 2012, up from US $256 billion in 2011; even expected to close in online retail revenue on US $500 billion in 2018. With comScore study revealing 4 out of 5 customers using smartphones to shop, more and more online businesses is looking to ease customer experience shopping on mobile. For brands looking to capitalize on smartphones’ closeness to customers, the numbers indicate that shoppers are not fundamentally opposed to mobile interactions with brands; rather they find these interactions useful if it meets their expectations. Shoppers use their mobile devices for connectivity and content. All they look for are improvements in how they consume and experience mobile content, but many mobile experiences are still lagging way behind. Shoppers prefer simplicity in shopping. All they need is a seamless and uncomplicated checkout process and research reveals that if this process is tricky, the shopper is quite happy to leave the site having not made their intended purchase. Brands must make it as easy as possible for the shopper to achieve what they are trying to do. An easy, quick and consistent mobile experience ensures businesses better customer loyalty. One page checkout and guest checkouts also woo shoppers to complete their checkout processes. Plus, options to change quantity, color or size in the checkout page decreases the chances of abandoning. Your online store can offer a fabulous selection of products, provide an immaculate online browsing experience and boast up-to-date customer service technology, but unless your checkout processes are fast, reliable and secure, shoppers will be looking elsewhere for their needs. Shoppers want to be guaranteed that their sensitive payment information is kept secure. It is therefore important to prioritize PCI compliance first and foremost, as this represents the prime standard for security in the eyes of your partners and end customers. Following Payment Card Industry Data Security Standard (PCI DSS) rules for credit card processing helps shoppers to build in trust in the checkout process. You might have come across a website on your smartphone that looks different in size, may be quite small for you to read and you have to enlarge or adjust it to read the content or click on call for action button. This is what disturbs mobile shoppers and can bleak your online future; such unsatisfied bulk will bounce off your website and go to your competitor whose website is easier to use. All you need is a website design that adjusts gracefully to fit on desktop, tablet, and smartphone browsers and makes life easy for your shoppers to read content, select product, click on buttons to proceed checkout and share information with friends. Shoppers demand the ability to pay with a preferred payment method, i.e. credit card, direct debit, PayPal, etc. With more than one third of US online shoppers having PayPal accounts and MasterCard and Visa having rolled out as wallet solutions helps simplify the payment process for the shoppers. Providing multiple payment options increases the probability of your customers finding their right choice of payments and decreases your chances of losing on sales. Plus, offering your regular or loyal customers option to store their credit card numbers on your site for future use helps ease the payment process and increase customer satisfaction.